Memories of wartime at Hill End hospital | Hill End, Wartime Hill End | Out of Sight, Out of Mind? 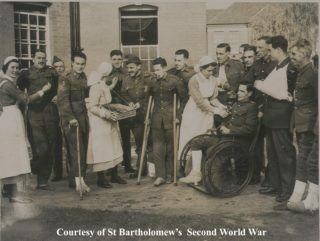 My mother, Mrs Dorothy Burton, of Beechwood Avenue, St Albans was a member of the Townswomen’s Guild and it is likely that she volunteered to entertain the wounded servicemen at Hill End hospital, by playing popular songs and piano music to them. This led to me, her teenage daughter, accompanying her and joining the audience when variety artists gave shows at the hospital. Jack Warner and “his little gal”, Joan Winters, appeared – a catchphrase of his was “Mind my bike!” – and also the American husband and wife team of Ben Lyon and Bebe Daniels, who were well known for their radio show “Hi Gang”. I met some of the walking wounded when Mother invited them to our home on Sundays. We offered to play family games such as 5 stones, Battleships, Whist or Table Croquet with them. We gave them a simple tea of bread, paste, lettuce, beetroot and tomato, or sometimes there would be peaches, tea and cake. It was Mother’s contribution to aid their recovery and alleviate their boredom. This page was added on 02/02/2010.